New location. New Cartel. Still based on a true story! This time, Netflix takes us to Mexico in the 1980’s, at the very beginning of the Mexico-USA illegal trade with their newest series, Narcos: Mexico, releasing worldwide on November 16th. 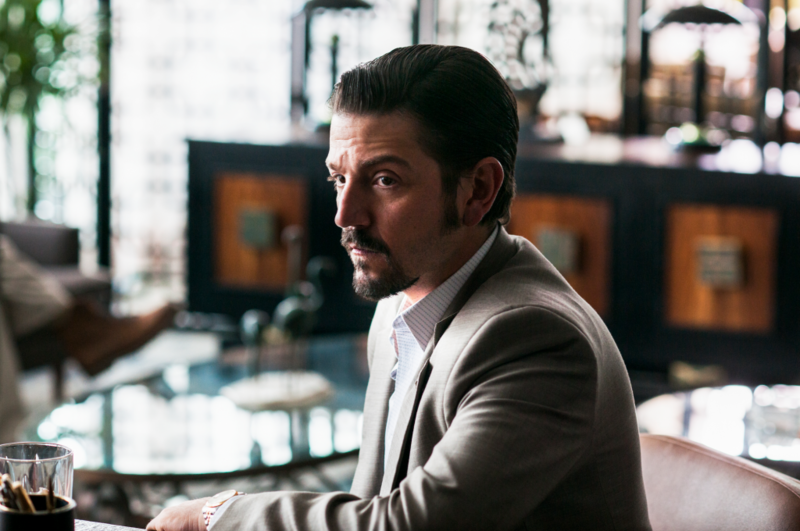 Miguel Ángel Félix Gallardo AKA El Padrino, played by Diego Luna, is the man behind the birth of this operation, starting with small shipments of marijuana and quickly moving to bigger things. 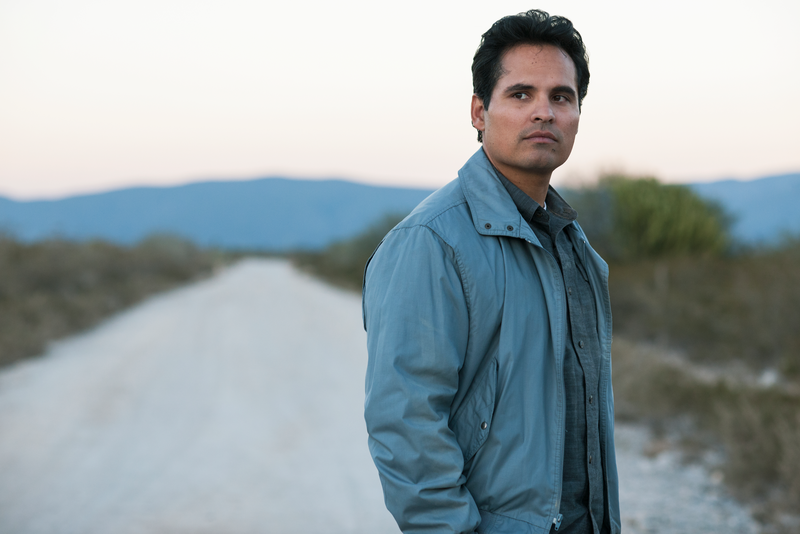 However, one man stands in his way, Enrique ‘Kiki’ Camarena, played by Michael Peña, a Mexican-American DEA agent based in Guadalajara, convinced he can shut down his operations. We sat down with the two actors to have a chat about their interesting roles, the reaction of the media and the difficulties they encountered while shooting the show. DL: El Padrino is different because this character is not a reflection of what the media makes out of him. This guy was a businessman and an entrepreneur! He owned a hotel, a restaurant and also worked for a bank. He invested in many projects and businesses around Guadalajara. He created a network that protected him but remained active in the business sector. To me, he was also a great politician because he managed to sit enemies down at the same table – people who wanted to kill each other – and managed to make them work together towards a common goal. He was a step ahead of everyone and that makes him a different man than Scarface or the rest of the similar on-screen characters. We’ve read that you didn’t go out and interview or meet people from that walk of life, why did you make that decision? I chose not to interview anyone about El Padrino when I found out about all the research that was done about the man in the past. I stayed true to the journalistic work and to the books written about him. These books carry quotes and stories from people that were really close to him. I decided that there was enough material there for me to work with and didn’t want anything else to interfere with it. Were you always a fan of gangster movies, and what did you think of the first two seasons of Narcos? I have definitely always been a fan of gangster movies. I think I’m always drawn to imperfect characters that explore the dark side and that are willing to cross a line I’m not willing to. That’s what always interested me as a viewer and as a kid. I couldn’t wait to watch Narcos part 1 as I have many friends that acted in it. I am friends with Wagner Moura and many of the Mexican actors that were involved, so for me, it was important to see their job and to see what they had accomplished. What are you reactions to the Mexican press accusing the show of glorifying the Mexican drug trade? Firstly, I think that they should watch the show before making any judgments. Secondly, I think our government is the one to blame. Our country forces so many people to join these organizations because it allows a man to be one of the richest in the world while more than half of the population is living in extreme poverty. I think that is what the media should be talking about. It is way too easy to blame a simple show. I would not be doing this if I thought this would be urging young people to make the wrong choices. How do you feel about a Mexican show creating this kind of buzz worldwide? I am very proud of that. I am proud of all the talent getting a chance to show the world what they are capable of doing. Many of my friends and people I grew up with working in theatre and cinema are part of this show and I’m glad they’re exposing their work in a bigger form. CWM: How did you prepare for this role of ‘KiKi’ Camarena who was world famous? MP: To be honest with you, I didn’t know who ‘Kiki’ was when I met the showrunner Eric Newman, who first told me about the man and how he was very instrumental in the war on drugs in America. I made my research and luckily for me I was able to answer a lot of questions when I spoke to Mika Camarena (his wife) and Jamie Kirkendale (Kiki’s colleague in the DEA). You want to know what makes this person tick, and sometimes they can have other motives for doing so, such as gain of money or power, but in this case he was a man who was destined for the search for justice. He wanted to make the world a better place, in his own way. He was somewhat stubborn and slowly became very obsessed in bringing down the cartel because he had seen it forming right in front of his eyes, and the people around him would not believe him. This led to frustration and he became more and more passionate about it. The most challenging part I would say was the schedule because I come from acting on the big screen and in movies you have 60 days to prepare for 2 hours of programming. However, in this one, there were 120 pages every month and that was a lot. The studying had to be a little bit different. As soon as we wrapped at the end of the week, I would read everything that I had to know for Monday morning on that Friday night, and then Saturday I would read Tuesday and Wednesday’s work, and then Sunday I would read Thursday’s and Friday’s work. I always wanted to stay 3 days ahead and just by reading over and over again, I knew the scenes by heart and it was much easier to memorize. But in movies, you have the job for a year and there’s one script so sometimes you can memorize it 3 months before shooting. Do you find any parallels between the drug issue back then and today? This problem is still affecting America today and until the buyers stop purchasing from the suppliers, the problem will not cease to exist. If we want to stop the cartels, we should just stop buying it. That’s just the way it is. Were there any moments on set that particularly stood out for you? I think that Mexico has some really interesting weather, especially in some of the places we had to travel to where it was ‘winter’. We were at this location, in the middle of fields, and it would be very hot at 10 in the morning and then at lunchtime it would start hailing, some really big chunks of ice, and that was pretty weird. I remember it happening three days-in-a-row, I don’t know if it was a sign from God or what? I have a movie called The Mule coming up, with Bradley Cooper and Clint Eastwood. I also just finished Dora The Explorer, which was interesting because it also has some Spanish in it. I am also going to be doing Fantasy Island at the top of next year, and then I don’t know…. I guess I will be looking for a job. Previous articleWhat Are Your Winter Preferences?